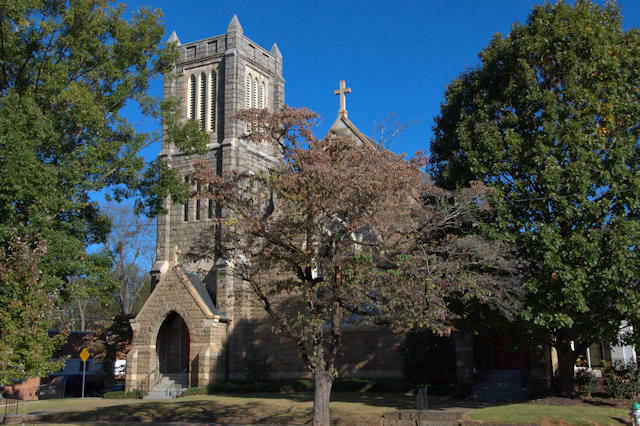 Emmanuel is the oldest Episcopal congregation in Athens, dating to 1842. When Dr. Richard Dudley Moore brought his new wife, Elizabeth Stockton, to Athens in 1835 she was concerned that there was no Episcopal church in the city. The daughter of the governor of Delaware and a granddaughter of a signer of the Declaration of Independence, Elizabeth had been a member of Emmanuel Episcopal Church in her native state. When the congregation was organized by Dr. William Bacon Stevens, the name was chosen to honor her. A New England-style structure was built in 1843 but by the 1890s the congregation had outgrown it. The cornerstone was laid in 1895 and this Gothic chapel, sided in Georgia granite, was completed in 1899.